Today, the Toronto Star published an editorial that admonished Toronto Taxpayers Coalition for budget analysis we made in January of this year. We noted that spending increased $1 billion over David Miller’s first three budgets as mayor. We contrasted that to Rob Ford’s record which increased spending $20 million over his first three budgets. The Star editorial correctly pointed out that Rob Ford increased spending by $180 million (1.99%) in his first budget in 2011 over David Miller’s final budget in 2010. But it neglects to compare this to David Miller’s first budget in 2004 increasing spending by $200 million (3.12%) over Mel Lastman’s final budget in 2003. The editorial also neglected to comment on Rob Ford’s second budget, which actually reduced spending by 0.03%; the first year-over-year spending reduction since Mel Lastman’s 1999 budget. Compare that to David Miller’s second budget. It increased spending by a whopping 7.58% – a full $500 million. 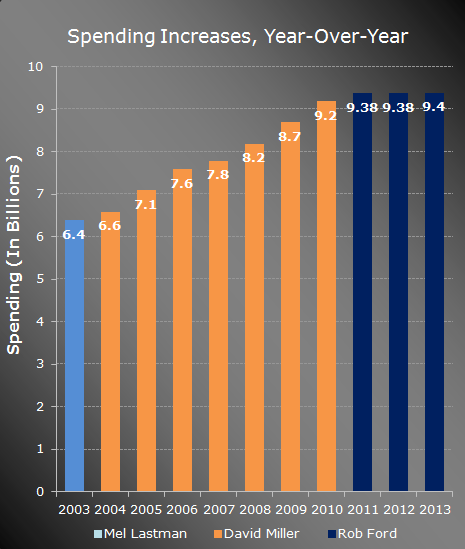 Miller’s second budget represented his largest spending increase. He came close to duplicating this level of fiscal mismanagement in 2006 with another $500 million increase (7.04%), in 2008 with a $400 million increase(5.13%), in 2009 with his third half-billion dollar increase (6.10%), and 2010 with another $500 million (5.57%). Rob Ford’s budget chief for these three budgets, Councillor Mike Del Grande, deserves a lot of credit for his work in putting a stop to huge spending increases. On the other hand Councillor Shelley Carroll, David Miller’s budget chief, has to wear her fiscal record like a millstone around her neck. We’re happy The Star is relying on analysis done by Toronto Taxpayers Coalition, but we humbly request it’s presented in the proper context. Regardless of The Star’s personal feelings towards any politician, they cannot dispute the huge spending increases under David Miller have effectively been halted under Rob Ford. The Toronto Taxpayers Coalition, under the diligent leadership of Matthew McGuire, has spent considerable time putting together a Taxpayers Voting Guide.